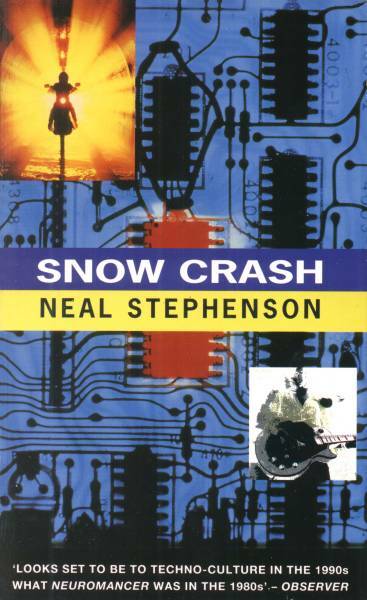 Snow Crash was Neal Stephenson's breakthrough novel and is the one that saw him being labelled inaccurately as a cyberpunk novelist. Snow Crash is a brilliant witty science fiction adventure. In the near future the nation state of America has broken down and people live in corporate owned mini city-states. The Mafia control pizza delivery and Hiro Protagonist a samurai sword wielding deadbeat hacker is a Deliverator of pizzas. Hiro is drawn into a complex plot to enslave people's minds when a computer virus/drug called Snow Crash is released onto the Metaverse. Trying to stop Hiro in his quest to save the world is Raven an Aleutian psychopath with razor thin glass knives and a Nuclear Weapon strapped to his motorcycle. This book is responsible for bringing into public consciousness many cyberspace concepts that are now becoming commonplace. The concept of the Metaverse and Avatars is now mainstream in MMORPGs such as Everquest and The Sims Online. Also the idea that the human brain is programmable and is capable of crashing has become accepted by neuroscientists and can be seen in the science of Neuro-Linguistic Programming. Stephenson demonstrates an ability here to dump a lot of information into your brain without you noticing, and although there are a few missteps along the way generally his science is sound unlike many SF writers. The one failing of the book is that the over-arching threat posed by L. Bob Rife and his plan to take over the world never seems threatening enough and dwindles in comparison to the actual physical threat of Raven. The world conceived of in the book is both a brilliant backdrop to the plot and a credible possible future that we may be facing. When governments lose the power to collect taxes then they cease to be of any use and citizens will seek the services of protection and education from corporations. If the first 25 pages don't get you hooked then put the book down, step away carefully and go numb your mind by watching television game shows. If you are interested by the subjects covered in Snow Crash see our page where we suggest Books and Websites for further reading.